The Mac Techs help students fix their devices so that they can get back to focusing on important class work. Photos by Eric Darosa. 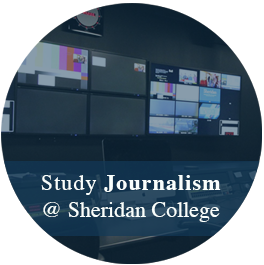 With the end of the semester fast approaching, Sheridan students are finding themselves swamped with assignments and exams. But what do you if your technology fails and you can not do your school work? 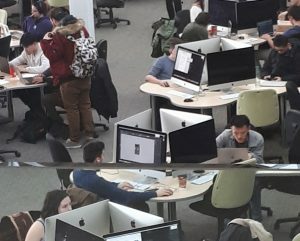 Sheridan College offers Apple tech support on campus for free. The college’s Mac Techs say they, “live and breath Apple” and service all kinds of tech problems for Sheridan staff and students. But some Sheridan Mac Techs aren’t confident enough students are aware the service exists and urge students to repair on campus for free rather than somewhere else for a fee. “I don’t think enough students really know about us, but all the services here are free, we don’t charge students anything,” says Mac Tech Graham Gentleman. Additionally, all of the Mac technicians are officially certified by Apple and offer genuine Apple support, sourcing parts for repair directly from Apple. But if you find yourself experiencing issues with your Apple device, make sure to backup your data before asking for a repair. Mac Tech Andrew Haacke urges students to do just this, “If you come down and you don’t have a backup, often we have to ask you to make a backup before we can do any work.” Students are asked to backup their data so that they do not lose anything important in the event of an accident. However, students can often avoid needing to repair their Apple devices at all if they are careful and actively try to avoid accidents. Haacke says, “as hardware continues to improve people are experience less tech issues, but recently most of our repairs have been on spills”Haacke says ginger ale, coffee and water have been the biggest culprits. In order to be prepared for the end of the semester, be sure to stay on top of any tech issues you may have. You can visit the Mac techs in room C153 Monday to Friday from 10 a.m to 5 p.m.
Eric Darosa is a journalism student focused on technological and broadcast work within the field.